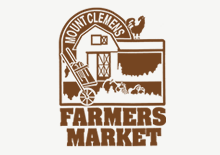 The Mount Clemens Farmers Market (MCFM) is an open air experience where shoppers can purchase the freshest, locally grown produce directly from area farmers. The Market is full of lively conversations where farmers and customers chat about the products, farms and sometimes even secret family recipes! Customers also have their choice of the produce that arrives at the market mere hours after being picked. Fresh locally grown foods are always packed with nutrients and rich flavors. Staples such as corn, bedding flowers, and pumpkins are mixed with rarer treats such as okra, Italian eggplants, raw honey-in-the-comb, and more. Come rain or shine our farmers and members can’t wait to see you soon. We invite you to join us and experience the market, we promise you will enjoy cooking with our fresh, locally grown produce. The Mount Clemens Farmers Market is open every Friday and Saturday from 7 a.m. – 1 p.m. May through November. Please .... No Pets on the market.